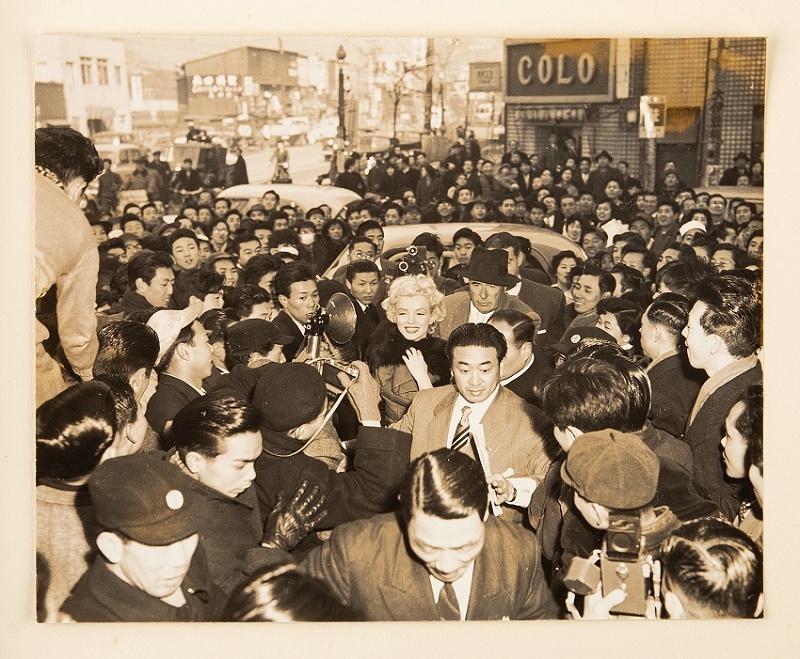 A rare photo album capturing Marilyn Monroe and Joe DiMaggio’s honeymoon to Japan will be offered for sale at Heritage next month. The album offers a glimpse behind the scenes of one of the 20th century’s most famous marriages, between the Hollywood icon and the baseball legend. 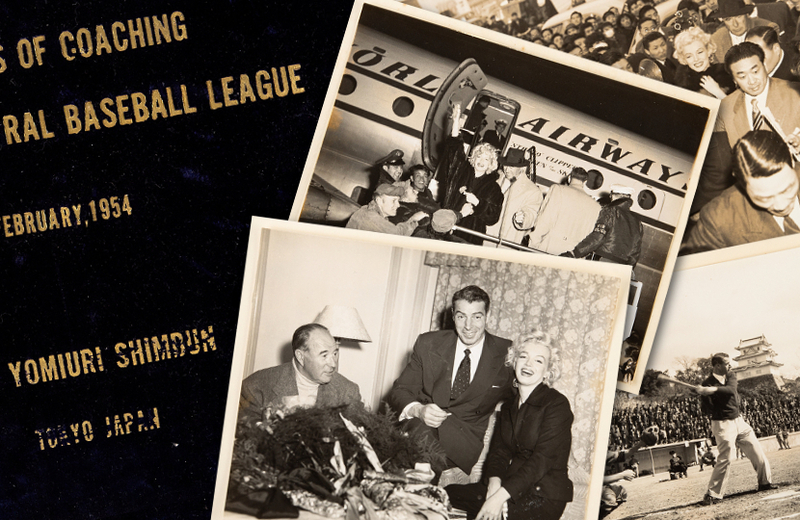 It features 30 photographs from the 1954 trip, which coincided with DiMaggio’s promotional tour of Japanese baseball teams, and Monroe’s visit to U.S troops stationed in Korea. The 24-day trip was fraught with problems for the newlyweds, and cracks in their relationship began to appear from the moment they arrived. Those cracks quickly grew into chasms, and Monroe filed for divorce just eight months later. 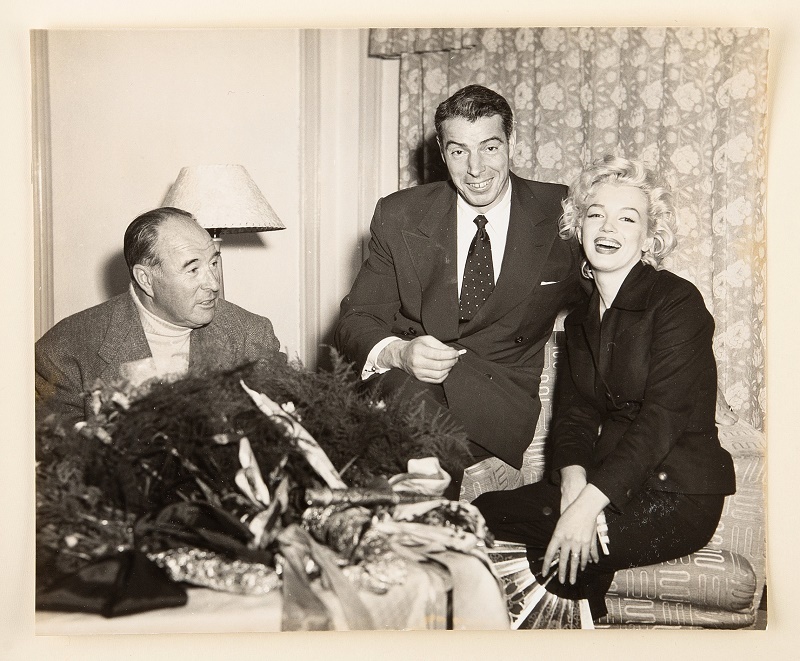 But despite the short-lived nature of their marriage, Monroe and DiMaggio’s relationship has continued to fascinate collectors ever since. 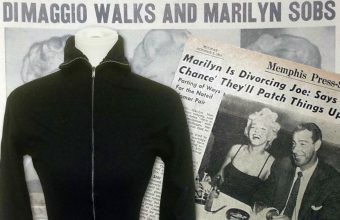 “They were one of the earliest superstar couples and the Halley’s comet of Hollywood marriages,” said Jason Simmons, sports consignment director for Heritage Auctions. The images in the album paint a picture of a couple who would never escape the spotlight, hounded by reporters, mobbed by fans and surrounded by hangers-on. The velvet-bound presentational album is only the second copy known to exist, and is expected to sell for more than $10,000. The only other known copy was owned by DiMaggio himself, and remained in his personal collection for 45 years before he passed away in 1999. In 2006 it crossed the block at Hunt Auctions, during the sale of DiMaggio’s estate, where it sold for almost $22,000. Marilyn Monroe and Joe DiMaggio were married in San Francisco on January 14, 1954, following a two-year courtship that kept an army of gossip columnists in business. A few weeks later they set off on their honeymoon to Japan – although they were accompanied by DiMaggio’s best man Frank ‘Lefty’ O’Doul, who had booked DiMaggio on a coaching tour of Japanese baseball clubs. Despite the less-than-romantic addition of a third wheel, the couple hoped they would be still be able to enjoy a break away from the glare of the public eye. However, any notions of a quiet getaway were shattered as soon as they landed in Tokyo, where an estimated 5,000 fans and reporters were waiting for them. 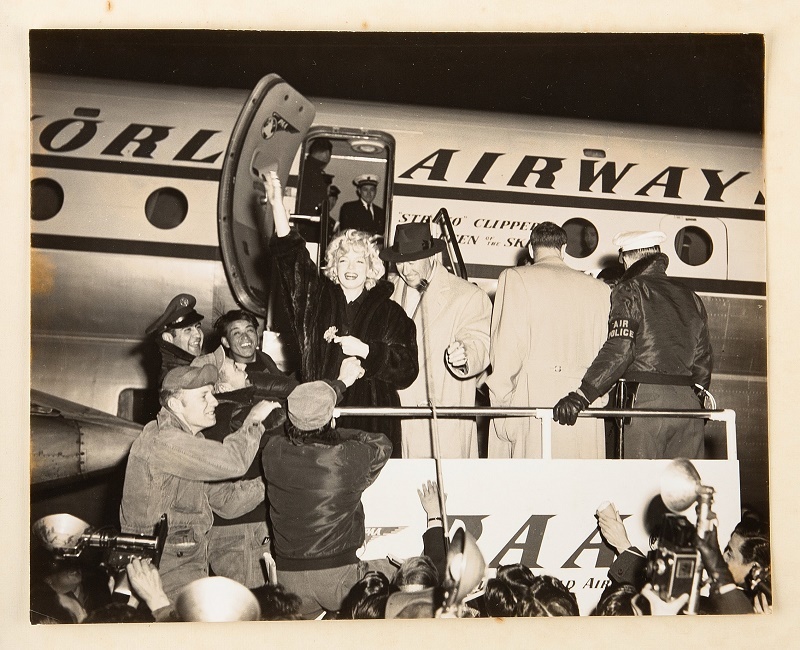 The crowd caused a crush as it swarmed forward onto the airport runway, and Monroe and DiMaggio had to be smuggled out through the plane’s cargo hatch to escape. Wherever they went in Japan, they were surrounded by a mob of fans. 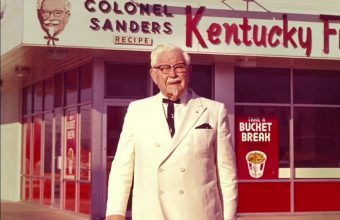 The hysteria caused chaos, with people smashing hotel doors, leaping on their car and storming baseball fields in a desperate to get a glimpse of the couple – and Monroe in particular. She had never been overseas before, and for the first time she began to understand the true international nature of her stardom. DiMaggio was also hit by the dawning realization that he was now married to the world’s most famous woman – and that the traditional marriage he was hoping for was out of the question. This constant pressure was too much for bear for DiMaggio, and his resentment towards his wife began to simmer. In the end it proved too much for both of them, and just eight turbulent months later Monroe filed for divorce, accusing DiMaggio of “mental cruelty”. DiMaggio never remarried, and held a torch for Monroe until the end of his life. Following her tragic death in 1962 he was responsible for arranging her funeral, and for the next twenty years had half a dozen red roses delivered three times a week to her crypt. 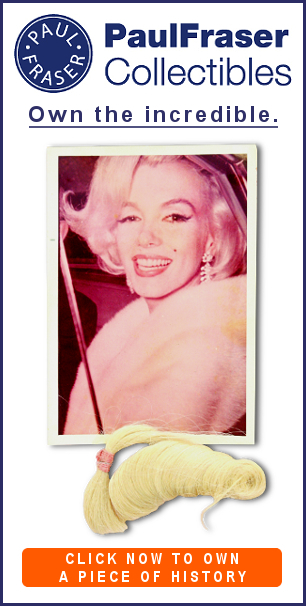 When he passed away in 1999 his final worlds were “I’ll finally get to see Marilyn”, and the auction of his estate in 2006 revealed he had kept countless mementoes of their relationship, including a copy of this album. As the only other copy known to exist, the sale at Heritage will now offer collectors a rare chance to own an intimate piece of history from one of the 20th century’s most iconic romances.